Brighten your decor with the MS International Onyx Crystal Glazed Porcelain Floor and Wall Tile. This beautiful tile features a smooth, high-sheen finish and a multicolored design in a neutral tone that complements any interior style. Designed for floor, wall and countertop use, the porcelain construction is marginally skid resistant and offers water absorption of less than 0.5% with a slight variation in tone, creating a unique, one-of-a-kind motif for bathrooms, kitchens and more. 16 square feet; 8 pieces per case. Case weight is 64 lb. Buy online MS International Onyx Crystal 12 in. x 24 in. 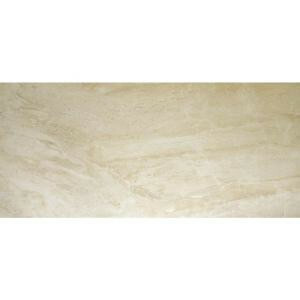 Glazed Porcelain Floor and Wall Tile (16 sq. ft. / case) NONXCRY1224P, leave review and share Your friends.